PB Recommended Quantity: 1 Ideal quantity determined based on usual requirements & potential savings. See bulk prices table to learn more about potential saving opportunities. Dentsply X Smart Endomotor is one among the best endodontic micromotors designed specifically to drive nickel titanium (NiTi) rotary files . This simple, compact and lightweight device can be adapted to the needs of your endodontic practice. X Smart operates on a battery or electrical power. The battery takes about 5 hours to reach full charge and offers 2 hours of use time. The LCD screen offers a clear display and is angled to facilitate easy visualization during the biomechanical preparation of the root canal. The various settings available on the device can be used to control the speed, torque, gear ratio, direction of file rotation and the auto reverse function. 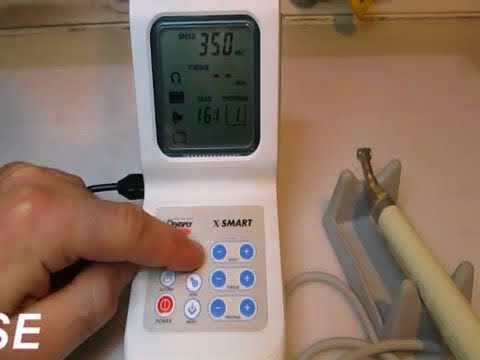 9 programmable settings are available on this smart device to personalize the settings on your endomotor. In addition to this, there appears graduated bar, which denotes, in real time, the load being applied to the rotary instrument and audible warning indicators. The handpiece supplied with the endomotor is a 16:1 contra-angled handpiece. It can be operated with or without a pedal. You can purchase the foot control separately to suit your individual preferences. The handpiece weighing 92g has an integrated on/off switch to control its functioning.